Sindika Dokolo speaks to COLLECTOR. following the recent official restitution to the Angolan State of five pieces of art from the national collections of the Dundo museum. Shinji Mask Cihongo. Tchiuta Chiefdom, Camaxilo region. Wood, metal. Height: 25.5cm; length: 15cm. © Native, Brussels. COLLECTOR. : Do you feel that African leadership understands the value of our appropriated material culture and possesses the will to fight for repatriation and the preservation of our cultural heritage? Sindika Dokolo: It’s only very recently that the question of repatriation, and the value of our cultural artistic historic heritage, has come forward in the news – and when I mean the news, I mean mainstream public debate. So it’s not only the question of African leadership that is not very knowledgeable, or aware, or conscious of all the various aspects that this question embraces – it’s the African society as a whole. And we realise, actually, that in the public opinion before all these debates – for instance I’m thinking about French speaking Africa – that this problem occurred between the Benin and French governments about the artwork that was confiscated from the Dahomey Kingdom in the late 20th century. The Béhanzin kings palace was sacked and looted during a military expedition by a French general, and was then integrated into the French museum, Musée Lam, and finally into Jacques Chirac’s Musée Du Quai Branly. So its only recently that in French speaking Africa the public, in general, has understood and heard about this issue. It’s true that development problems, economic problems and social problems have really completely confiscated the debate and narrative about Africa – not only abroad but also in Africa itself. So these questions of culture have always tended to come second place, and not considered as important or vital – while it’s actually the opposite. It’s actually deep important question that help us understand and define who we are and rediscover our self-worth and identity. Without which, in my opinion, there’s no possibility for any option of development, economically that is. Do you have any thoughts on how we would develop and realise an African equivalent of the ‘Washington Principles’? It’s very tricky to try and compare two different moments in history with two different environments. Although there are similarities in the violence that occurred with the Nazi confiscation of arts from certain Jewish families in Europe to that of the colonisation of Africa – all aspects are not completely comparable and equal and I think it would be dangerous to try to jump sequences. In the case of Africa, we should create a document that addresses and solves the issue of giving the African audience a legitimate right to access this very important page in our history and culture. In my opinion, I don’t think we should be asking ‘is a museum going to have to repatriate the work or not?’ – as is the case with museums like the Tervuren Museum in Belguim, which holds 80% of all masterpieces from my country, the Democratic Republic of Congo. We should be asking whether these museums ever legitimately ‘owned’ the items, and do they now send it back? A number of museums have sent some items back, and we didn’t have the right infrastructure or the correctly trained people – and perhaps neither the level of understanding around the importance of these assets. I also think it’s really important to have a debate around what kind of responsibility comes with holding 80% of the masterpieces ever produced in the DRC. What type of responsibilities does that create on behalf of the museum holding them? How can the museum start working more actively, or proactively, in trying to compensate this very important part of our history – and who we are, and the fact that it’s not there anymore? Colonisation has deconstructed this amazing culture that defined who we were – and now there’s this opportunity to work with these museums around trying to put back together, and reconstruct, something. These issues, for me, are more important or strategic, rather, than just clarifying who owns the items, and were they should be transferred to. I understand that there’s a lot of frustration behind this debate, but I think as an African collector and patron of the arts, I try to avoid falling into these kind of emotional discussions. 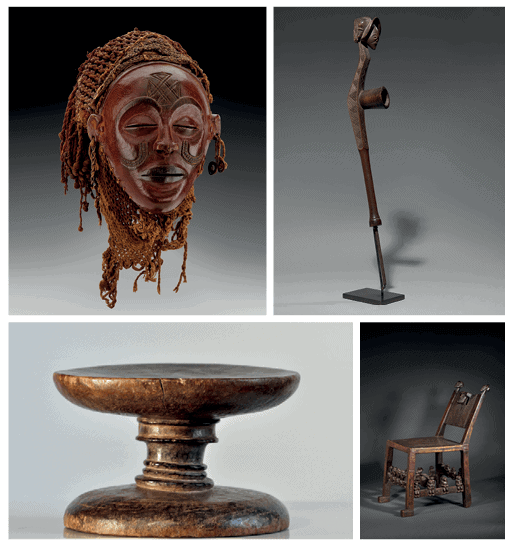 CLOCKWISE FROM TOP LEFT: Chokwe Mask Mwana pwo, Lunda region. Wood, vegetal fibers, metal, Height: 22 cm. © Studio Philippe de Formanoir – Paso Doble. Chokwe Pipe peshi. Wood, iron. Height: 62cm; length: 10cm. Chokwe Chair, citwamo ca mangu. Sanjime Chiefdom, Dundo region. Wood, leather. Height: 55cm; length: 33.5cm. Shinji Stool Citwamo, Shakasambi Chiefdom, Camaxilo region wood. Height: 11cm; diameter: 18cm All images courtesy of the Sindika Dokolo Foundation. There is so much work to be done around art and culture development in Africa if we are to even build a modest awareness in African societies. What role do you see these important artefacts playing in this regard? These works of art have yet to find their legitimate place in the history of art itself. So of course it would be very important for Africans to have a better understanding of where they’re from. To have a more positive, more respectful, more dignified look towards where we come from. We need to try and appropriate ourselves of who we really are and who our ancestors were and what they were about – and this incredible approach to art. But I think it would also be very important for the world in general. When you look at Christies, Sothebys, and all these auction houses, you realise that there are some art works – classic African art works – that cost fortunes. This is not only because they are rare tribal objects, but because they are real artistic masterpieces. 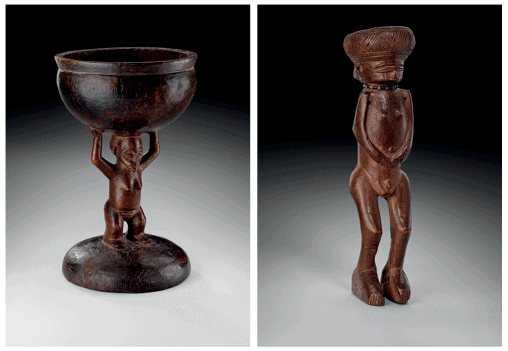 European art identifies things and African art embodies things. I think the whole idea of how art intervenes in society is so interesting, and perhaps ahead of how art intervenes in our contemporary societies today. There is so much to learn, for instance we have a problem – like the capitalist approach of the market – we need to own. So our interest towards art is very much one of covetousness and investment. The way art intervened in a lot of traditional societies in Africa was much more interesting and advanced in a way. For example, the artwork is not the mask, the artwork is the masquerade – the art of performance in the moment. The artist is not only somebody who creates only beauty or interesting things to look at, or pleasant things to look at – he is a medium between the invisible world and the visible world. For example, if you asked an African artist a couple years ago to draw you pain or sorrow or hope, or produce a piece of artwork, he would do so without any problem. But if you were to ask the same from a grand master in Europe to do the same, it would be impossible. He could do something very beautiful and elaborate, but he would produce his reality and put some of his emotions in the pictures. However it would be absolutely impossible for him to embrace these concepts. I think it will be really interesting for everybody to start reconsidering how we look at these very powerful artworks – and through this experience we actually start reconsidering the way we look, as Africans, at ourselves and our past. I think that to me it’s very interesting if we consider it from the perspective of what contemporary African art is today. We naturally are heirs to this amazing artistic practice. I always encourage young African artists who go there to revisit this traditional culture. 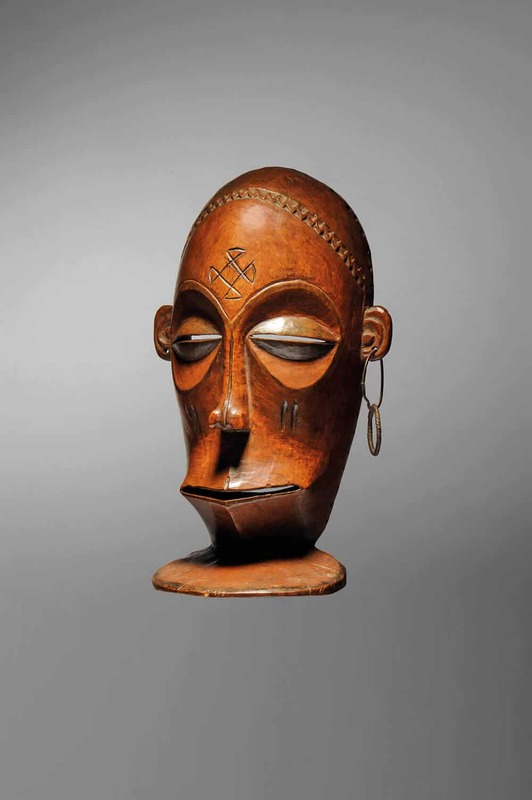 When you declined to loan the Musée du Quai Branly-Jacques Chirac in Paris works from your collection what reactions did it generate and did your decision have any measurable impact that you are aware of around the issue of repatriation? There is an association of people of African descent in France called CRAN and they have done some amazing work. They have created awareness around questions surrounding the specific group of artworks that used to be in the Musée Lam, and are now in Musée du quai Branly – Jacques Chirac. These works of art and artefacts come from what was formerly the palace of the king of Béhanzin in the Dahomey Kingdom – now Benin. It was looted by the French general as a sort of punishment for rebellious attitude by the King. It was a political action to show ‘I can destroy all your history and what you believe in and it doesn’t matter as I’m the only authority and the only reference here as a French general’. He then confiscated everything and brought it back to France and when he passed away in the early 20th century, he donated it to France. I was very shocked when the Minister of Culture of Benin wrote to one of the members of the government in France asking to start discussing possibilities of restitution of the very important part of the history of Benin and Africa. The answer was very shocking – they were told that there is a law in France that prohibits any art work that has been integrated in French public assets before the Second World War to ever be returned. I thought it was so unacceptable and disrespectful that I had to do something about it on my level. There was this really important exhibition about Gabon art in classical African art. I had an agreement with them to lend five pieces of artwork, and I decided to cancel just in sign of protest. I did this through a small video that I posted on my social media explaining why I was doing it and I don’t know if it had a big impact – but I joined my voice to the voice of CRAN. Altogether we managed to make it a question of principle that gained enough critical mass to get President Macron to decide, and I was impressed by his swift reaction. He said that, yes in principle it’s unfair and unacceptable and we have to start working on repatriation. He chose three experts to work on the conditions of repatriation from their side. The CRAN decided to choose six or seven people, and have asked me to be one of the experts on their side which I gladly accepted. For me it’s not just about repatriation from a justice view – but it’s really to create the necessary conditions which means awareness and interest, in the wide African public opinion about the importance of this act, and the importance of these works of art. Some people see it as old things from the past but it’s much more than that. It carries a lot of cultural DNA and a lot of history, where we come from and who we were, and we need to rediscover that and we need to recover that – it’s very strategic to me. LEFT TO RIGHT: Shinji Cup panda. Chiefdom Mwakavula, Camaxilo region. Wood, Height: 21cm; length 13.2cm. © Studio Philippe de Formanoir – Paso Doble. Chokwe / Lwena male statue. Lunda Region – Chitato, Nashili Village. Wood, glass paste, horsehair. Height: 22cm. Courtesy of the Sindika Dokolo Foundation. Are you aware of any other prominent collectors using their influence to challenge international institutions to repatriate plundered art from the continent or have you considered using your initiative to challenge other collectors to do right in this regard? When I came across the situation of the museum that had been completely destroyed during the war, and then rehabilitated in a difficult time for Angola when rebuilding the roads, hospitals, schools and ports was a priority – I found the government was still wise and strong willed to finance the rehabilitation of a museum. That means a lot to the Chokwe people that live in Lunda Norte, the province of Lunda Sul, the Province of Moxico all the way to Zambia. This mythical museum has been the headquarters of the world-renowned specialist of Chokwe culture. I’ve been studying it because I bought all the archives and it was my responsibility not as a collector, but as an African that understands the importance of these artworks. Also the fact that the Angolan state made such an effort to rehabilitate the museum but hadn’t grasped the aspect of the importance of these artworks that had been scattered around the market. My first reaction was to go and study different cases of restitution, so I went to go and study the acropolis and the Parthenon. And you know the pieces around the Parthenon have been stolen by the British at the end of the 9th century – it still won’t be returned. It is only now that some politicians are discussing the possibility of returning them. The Greek government has been really pushing and trying through diplomatic and political channels – but so far has been unsuccessful. So I thought this question of government to government might not be the most efficient one. Then I studied the case of in Nigeria, the FA Kingdom – these incredible statues of busts and heads, a lot of these disappeared during the Biafran war. Nigeria has decided to act in court so there is no art being sold in public auction and what I’ve realised is the market has gone underground. Pieces still exist and are still sold much more discreetly and more expensive – because they’re illegal. But it didn’t really generate the expected affect which was managing to get back these really important works of art. So I thought of a system that would be more efficient and a mix of all these experiences. That’s where I came up with the idea of saying that we are first going to identify as many works as possible, but there’s tens of thousands that belong to the museum. So working on archives etc, I have a permanent team in Brussels doing this who are managing to identify old pictures and recognising pieces which are not so easy when you have old black and white photos of a room and a 1 mm size photo of a work in the corner. What we then do is try to locate on the market where this piece has appeared for the last time. Whether at an auction or at an exhibition or through dealers and we try and find the owner. When we approach them we already have all the elements proving the piece belonged to a museum and we give them an option either to sell it back to us at the value they purchased it. This is usually at that market value or much lower – it could be from 25% of the value. That’s what I’ve paid for the twenty pieces more or less of what we’ve recovered. The alternative of course is facing our lawyers – and so far we haven’t had any case of people refusing. Now sharing this experience raises awareness of the importance of our culture and our history and this amazing form of art practice and the way art intervened in this society. The real important question to me is this very important part of the African identity and history is absent from the continent. How can we think of ways for it to play it’s strategic role on a continent that is at a strategic cross roads of it’s history. ‘A Culture of reconstruction’ can be found in the latest issue of COLLECTOR. magazine. It can be found in the ART AFRICA, issue 13, TREASURING HERITAGE.